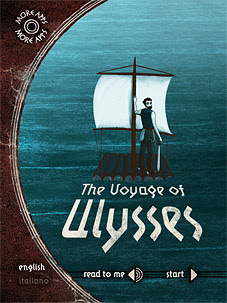 The Voyage of Ulysses, a gripping app for tweens based on Homer's classic Odyssey, is a finalist for the 2012 Cybils Book App Award. The Odyssey, Homer's classic tale of adventure, longing and struggle, is at once utterly gripping and hard to digest for many of today's children. I remember trying to teach this epic poem to a class of urban 9th graders - this hero's journey felt far away from their reality. 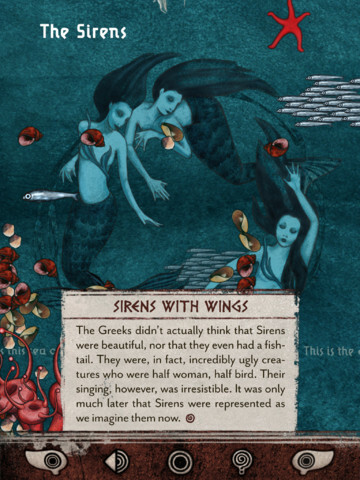 The Voyage of Ulysses, a book app developed by the Italian company Elastico Srl, makes this classic story accessible for middle grade children while staying true to the original story. With pathos and romance, the Odyssey is at once a gripping story and a fascinating look at how people long ago lived their lives. 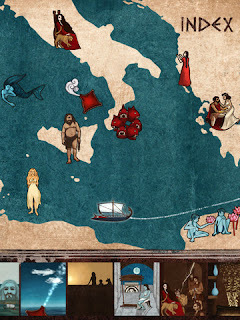 In twenty-four screens, mirroring the traditional 24 books of the Odyssey, this book app tells the story of Ulysses's ten-year travail on his way home from the Trojan War. Spellbinding, slightly accented narration continues while we explore the delights of each page - arrows that rain from the ramparts of Troy, Greek warriors creeping from the giant horse and setting Troy ablaze, text that spins into the whirlpool Charybdis. Understated art, music, and sound effects match the lyrical, timeless style of the text, while pull-up sidebars provide even more information. A truly engaging app that also succeeds in communicating the themes of loneliness and exile that make Homer's epic emotionally arresting three thousand years later. This is an excellent example of a book app for older readers that uses effective narration controlled interactive features to draw readers in. The distinct chapters kept the pacing of Ulysses' journey moving clearly toward his homecoming. The interactive features were enough to keep the reader engaged without ever taking them off-task or off-track. I loved the interactive map (on the right) that you could use to explore Ulysses' journey. Share this book app with fans of the Percy Jackson series, Greek mythology and epic journeys. I hope this app reaches a wide audience in the US. So many of our stories continue to draw on Homer's quintessential hero's journey - we need to keep sharing it with children. This a fantastic example of an international app that appeals across cultures. After seeing it on the Cybils list, I purchased this app. This will be a great resource for my daughter who is getting ready to read the Odyssey. Fantastic, Jeff! I can't wait to hear what she thinks of it.